Interwoven in the history of the Leeds Golf Club is the story of the beginning of golf in Leeds. It was on the Soldiers field at Roundhay that the first golf ball was struck in the Leeds district. In 1896 several gentlemen met in the Gipton Wood Inn and decided to form a golf club. They obtained the original lease of the present course from the local at a rent of £25 per annum. After some deliberation, they decided to name the Leeds Golf Club. The old Roundhay Club was merged with the Leeds Golf in 1900. The famous golf architect Doctor Alastair MacKenzie was a member of Leeds Golf Club between 1900 and 1910. During that time he gave advice on bunkers and the layout of the course. Doctor MacKenzie has influenced the design of many courses including St. Andrews, Prestwick, Troon, Alwoodley, Moortown, Royal Melbourne and, of course, Augusta National. Leeds Golf Club are active members of the Dr. Alastair MacKenzie Society. The Leeds Cup - The Oldest Trophy in Professional Golf Worldwide. 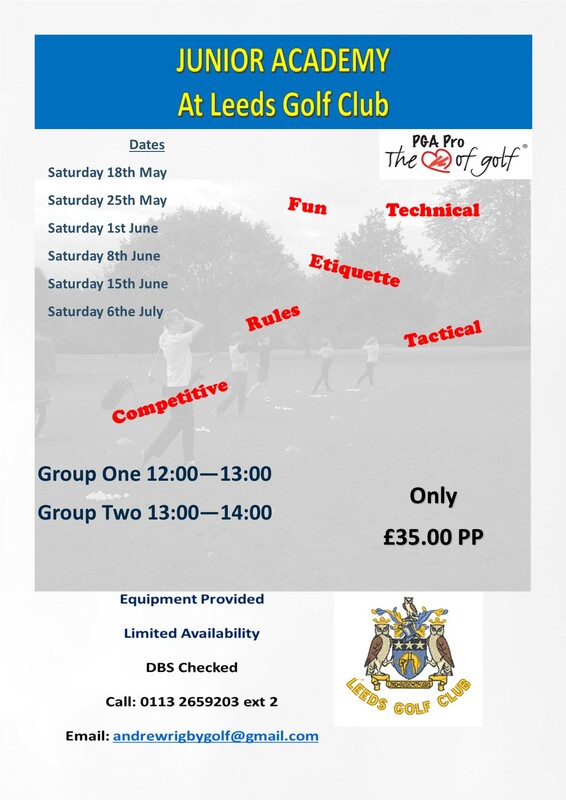 Presented to the Professional Golf Association on its formation in 1901 by Alderman Penrose-Green, Lord Mayor of Leeds and President of Leeds Golf Club to be competed for annually by professional golfers. The first competition was held in 1902 at Leeds Golf Club. Leeds Cup Winners and also Open Champions between 1902-1930. Harry Vardon, Ted Ray, Sandy Herd, George Duncan. The 1929 winner, Abe Mitchell, unattached, became private professional to Samuel Ryder, who was a member at the Veralum (St. Albans) club. The figure on the Ryder Cup is modelled on him. Leeds Cup Winners and Ryder Cup players George Duncan, Archie Compstonand Abe Mitchell were part of the historic 1929 team who played at Moortown GC. The 1939 winner was Bill Davies of Wallasey, who, at the outbreak of WW2, buried the Leeds Cup along with other silverware from his club, in an ice box and sacks in the sand dunes along the coast until the end of hostilities in 1945. Bill Davies, Ted Jarman, Jack Busson, John Fallon, Eric Green, Syd Scott, Alec Caygill, Gordon J. Brand and Howard Clark were all Leeds Cup winners and played in the Ryder Cup in later years. In 1938 the club hosted the Yorkshire Evening News Trophy for the first time. 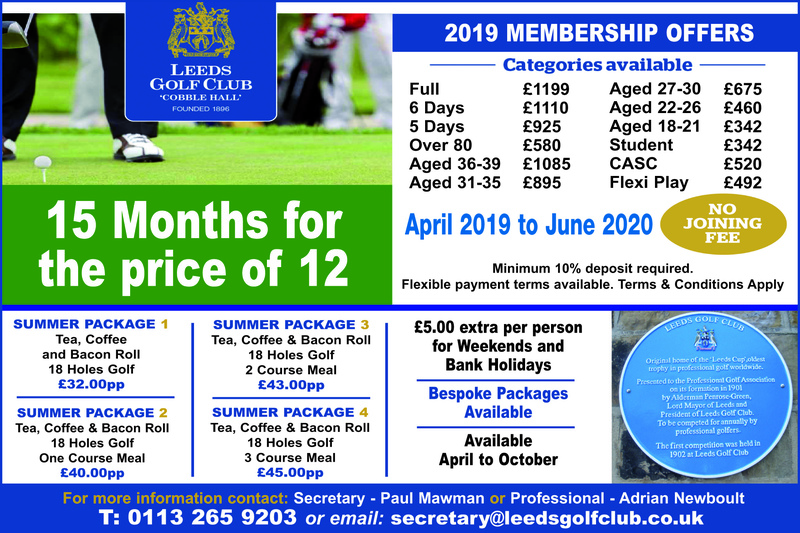 Top quality amateur golf has also played a major part with The Leeds Amateur Cup being hosted here since 1912 as well as The Cobble Hall scratch since 1962. Both are still played for every July and August to this day.